LONDON, WATERLOO, UNITED KINGDOM, July 6, 2018 /EINPresswire.com/ -- Event organisers caught up with Nicolas Sireau, CEO and Board Chair of AKU Society and Toni Mathieson, Chief Executive of Niemann-Pick UK to discuss challenges and opportunities for Patient Organisations within the rare disease treatment field and their involvement in the forthcoming event. The greatest research challenge to overcome in the field at the moment? Nicolas Sireau: There is a real challenge for patient groups and for academic clinicians to access the funding for Rare Disease. We must rely on the EU commission where only a small proportion of applications get the funding. Toni Mathieson: One of the greatest challenges for us all at present is the political landscape and the implications for research/funding and collaborative working. Where do you see the greatest opportunities for Patient Organisation? Nicolas Sireau: The rare diseases sector has been evolving positively, and there are now umbrella groups, such as EURORDIS, who have really helped the sector to move ahead in Europe. Social media and a number of openings from technology and media are constantly increasing our interaction with the pharmaceutical and biotech industry. Toni Mathieson: To make further progress for rare disease patients and their families we need a joined up approach, we can’t go it alone. We will need to work together, with those in leadership across patient advocacy, industry, policy makers, health and social care professionals and the science and research communities. Who are you most looking forward to hearing from at the Orphan Drugs and Rare Diseases conference and Why are you supporting the event? Nicolas Sireau: Very interested to see the different perspectives and strategies that pharmaceutical companies and patient organisations will display during their sessions – along with their similarities which usually point to collaborative efforts. As a patient group we are supporting and helping patients to get access to treatment and move ahead with the research – this is what makes us interested in Rare Diseases and the conference in October. SMi Group is pleased to welcome the expertise of Nicolas Sireau, CEO and Board Chair of AKU Society and Toni Mathieson, Chief Executive of Niemann-Pick UK onto the agenda for its 8th annual conference - Orphan Drugs and Rare Diseases. They will be outlining the work of their Patient Organisations in depth, providing examples of: setting up an orphan drug clinical trial with a rare disease patient group; recruiting patients for CTs; the impact of multiple trials on a small patient population; communicating with pharmaceutical leaders and lobbying for equity of access to expert care and treatment. 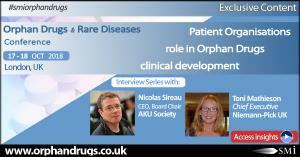 There are many other topics discussed at the Orphan Drugs and Rare Diseases Conference.